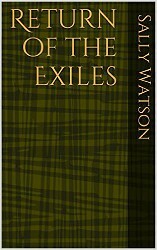 Another historical fiction gem by Sally Watson. The author writes: “I am an American Anglophile who lived in England for nearly 25 years. I first visited England, Egypt, Jordan, Israel, Lebanon and Turkey in 1955. I was fascinated by the history of the Near East, made many subsequent visits and many Arab and Jewish friends, a number of whom helped me get material for To Build A Land, The Mukhtar’s Children and Other Sandals. I have tried to get into the minds and feelings of the various peoples involved. I do like the people—if not always their governments! Among the recipients of author’s dedication: and for everyone who cares about historical truth, who is interested in modern Israel, and who likes a good read.